The Los Angeles Fire Department distributed and installed thousands of smoke alarms to local residents in high-risk areas between 2014 and 2015. They did this in response to alarming nationwide statistics about smoke detectors and smoke-related deaths. While over 90 percent of homes today have smoke alarms, millions of Americans still do not have them. Several other cities across the United States are taking action to encourage the use of smoke alarms. In about 70 percent of recent reported home fires, the home had one or more smoke alarms. Only about 50 percent of those sounded when there was a fire. However, some fires were not serious enough to activate the smoke alarms. In incidents where the fire was bad enough to trigger a fire alarm, the devices went off around 85 percent of the time. Approximately 35 percent of home fire deaths happened because there were no smoke alarms installed. And one percent of the reported deaths happened because of a fire that was not significant enough to activate the smoke alarms. In homes where there are smoke alarms, the risk of dying in a fire is cut in half. However, this statistic is irrelevant if the smoke alarm is not working. 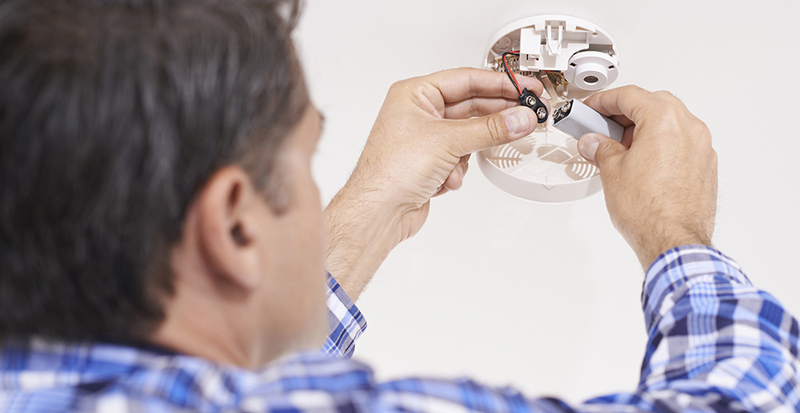 To ensure proper function, homeowners or renters must check their alarms regularly. Batteries should be replaced at least once per year with high-quality batteries, and all smoke alarm units should be replaced every 10 years. While it is helpful to have multiple smoke alarms, even one smoke alarm in the home reduces death risk by about 35 percent over homes that do not have any smoke alarms. When alarms fail, they usually do so because of dead batteries, disconnected wires or missing components. Some people disable smoke alarms while cooking or doing something that may set them off. If they reconnect a device improperly, accidentally break it or forget to reconnect the battery, they put themselves at risk. Smoke alarms should never be covered. If a smoke alarm is too sensitive and becomes a nuisance, do not remove or disconnect it. Talk to a local fire department. Relocating the device to another part of the room or replacing it with a high-quality alarm may solve the issue. Also, do not remove smoke alarms from kitchens. Over 40 percent of households with smoke alarms in the kitchen reported that the device went off at least once per year, and this was due to cooking about 75 percent of the time. If an alarm starts making chirping noises, replace the battery immediately. To learn more about safety tips for smoke alarms and how they can protect homes from costly insurance claims, discuss your concerns with an agent.